On February 12th 2016 beautiful 'Hatti Bubba' was delivered of a daughter 'Heidi' ~ 'Supreme Champion Dual Champion (Tracking) Hounsley Hey Ho Here She Goes [AI] TD'! Sired by 'American Champion Ha-Penny's Too Much Trouble (USA)', the gorgeous 'Heidi' (the 'Bubba's Bubba') has taken to the competition arena in a big BIG way winning her first BEST IN SPECIALTY SHOW sash, a Royal Show BEST IN GROUP award & gaining 2x ANKC Titles before she was 10 months old! Click here to veiw 'Heidis' DOL Profile, Pedigree & results. Well! It didn't take long for us to come full circle ~ & 7 years after our last Beagle crossed over the 'Rainbow Bridge' we found our house blessed once again with the pitter patter of punchy Beagle paws! Our good friend Julz Lalor ~ breeder & owner at Hounsley Kennels Australia's #1 Beagle Kennel 2013 & 2014 (DOL Pointscore), & home to Best In Show, Grand Champion, Dual Champion & Dual Supreme/Tracking Champion & Grand Champion 'Track & Search Dog' titled Beagles ~ was quite right in believing that we still had a soft spot for the breed that had started it all ~ & she very graciously allowed the beautiful 'Miss Hatti' ('Dual Champion [Tracking] Hounsley Harmony On Broadway TSD'), to make the long trek north & join us here at 'RHEGED' to sprawl on our sofa, create havoc & take the occasional spin around the competition ring! Well! Lets face it! If you are going to return to a Breed ~ what better way to do it than with one of the finest examples in the land! 'Hatti Hound' ~ the 'Bubba' ~ has amazed not only us, she has made the dog world sit up & take notice ~ in true 'Hatti' fashion of course! In the experienced hands of Julz, she has simply exceeded everyone's expectations! She attained her 'TD' title (Tracking Dog) within a matter of weeks upon returning to Victoria, then she knocked over her 'TDX' title (Tracking Dog Excellent) the following week! Could she possibly top that? Of course she could ~ she went & thrilled us AGAIN by winning 'Best of Breed' at the Adelaide Royal Show aged just 7 months old! This AMAZING win (over older mature Hounds), gave her the final 25 ANKC points required to make up her Show Champion title! Amazingly, by the tender age of 7 months, Hatti had attained 3x ANKC Titles ~ the last 2 were gained just 3 days apart! Could she better this? Of course & on the 7th June 2014, Hatti gained her 'Tracking Champion' Title - making her a DUAL Champion! This was soon followed up wih yet another more ANKC titles ~ quickly adding her 'Grand Champion' & 'TS' (TitleTrack & Search Dog) Titles, which she then quickly converted into a the 'TSDX' title (Track & Search Dog Excellent) (TSDX). which meant we had to add even more Title letters onto both ends of her name! In 23rd October 2015 she delighted yet again when Julz & Hatti passed the 'TS Champion' title (Track & Search Dog Champion), & she had finished this title off with a super 'Excellent' grading! 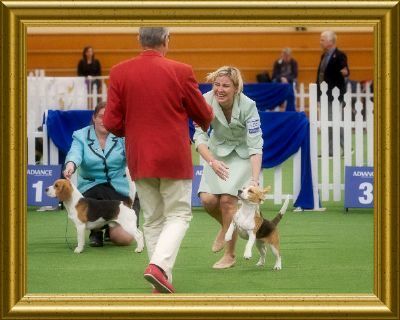 What a fantastic, outstanding little Beagle Hatti Bubba is! It took us all a few days to realise what had just happened & for the full impact of her potential & ability to actually 'sink in'! I have a feeling that we will all continue to be amazed time & time again as this stunning little Hound grows up. Hatti is co owned with her breeders; Julieanne Lalor & Paul Hissey ~ super merry, confident & very correct ~ she is like all our dogs here, bred in the purple! Her parents are, as you would expect, stunning & sound examples of this ancient breed. 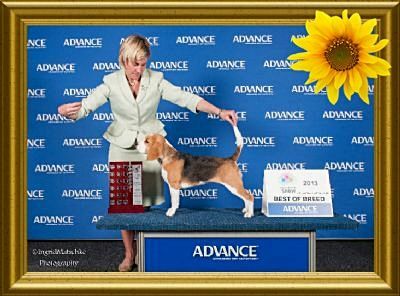 In October 2013 her sire 'Bert' became the first Beagle to hold both the Supreme Show Champion & Champion [Tracking] Title! He has since gained both the Endurance & the Grand Champion Track & Search Dog Title as well! 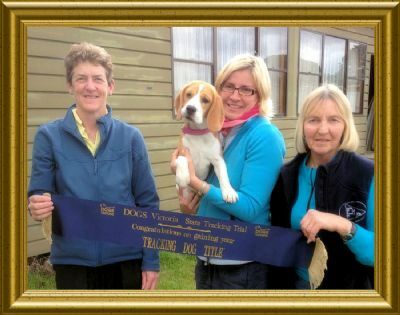 Of course, not to be out done, Hatti's dam 'Hattyette' was the first Beagle in Australia to hold the Champion Track & Search Title plus the titles Tracking Champion & Show Champion! Hatti's beautiful Grandmother 'Georgia'~ 'Australian Track & Search Grand Champion Dual Champion [Tracking] Davricard Dimple ET (Imp UK)' ~ made breed history by winning 'Victorian Tracking Dog of the Year 2012', she is not only the first Beagle ever to achieve this, but the first Hound to take home this very prestigious award! It's no wonder that young Hatti is already an over achiever! You can view Hatti's outstanding Sire & Dam on ou r Proud Parents page. Back down in Victoria with Julz & Paul for the Southern Summer 'Season', Miss Hatti continues on her 'merry' Beagle way ~ firmly stamping her paw print on everything she does! It is in her genes to excel & we know the amazing duo Hatti & Julieanne will keep on doing just that! Our heartfelt thanks go out to Julz & Paul for entrusting us with such a precious & very special little bundle of mischief, love, joy & fun ~ all wrapped up in a striking tricolour jacket! It is a pleasure & honour to be a part of this young Hounds journey. She has stolen our hearts forever!